Mom living in the USA, in her 20s or 30s, with one or more young children (11 months-4 years). Mommy/lifestyle/family/travel Instagrammer with loyal following of other moms. Ideally 8,000-30,000 followers, approximately. Our product, a Kids Travel Tray, keeps little ones entertained so that parents can relax on-the-go or at home. It fits most conventional strollers, car seats, and high chairs, which makes it perfect for use in airplanes, busses, cars, your living room, the park, the game—you name it! Kids can use it for playing, snacking, reading, drawing, etc. Please see our link for more details. We have a pink and blue version of our tray, and the promotion can be for both/either. 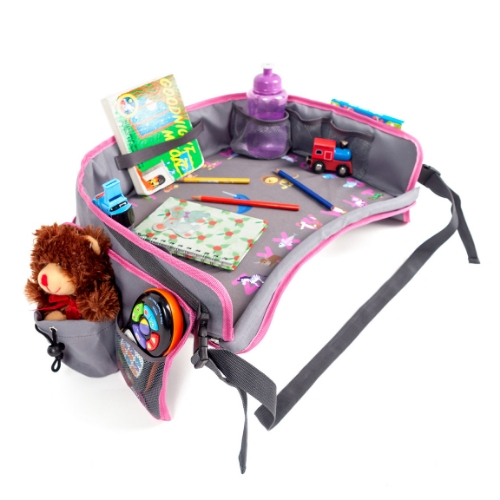 EVERY Kids Travel Tray comes with a bonus Back Seat Car Organizer. Accessories included in our attached photo are not included. We have many more available images available upon request. This promotion is part of our launch strategy for this new product. A coupon code will be provided to include in the caption of the post. Our goal is to get sales and honest reviews from customers, plus to make people happy! We hope that we can find the perfect partner to work with! A coupon code will be provided for the caption of the post.